Well, it's that time of year again, no not pre-Christmas sales, it's train show season. Model Builders Supply has about 11 shows planned for Fall & Winter, so you're bound to see us at some show. Shows offer good oportunity to spend time speaking with customers to see what they want and don't want, we can engage with them and put a face to the Facebook friends we have made over the years. It's also a great time to teach with formal workshops, in-booth hands on demos or visual instructions on how to build the perfect tree, paint our brick or stone plastic 3D sheets or simple instructions on cutting and using the right glue with different plastics. Ouite often we bring items to the shows that aren't available in store or online AND we bring them to you, so that means no shipping and you get to take advantage of our show pricing which is typically 15% off the MSRP. That brings me to another point, pricing: keep in mind we do our best to keep prices low, there's a lot of hours and hard work put into bringing a "store" to each show. It allows you as consumers to see many products in one place and compare quality and pricing. So there's no harm in asking for a deals, but we might say no, so please don't be offended. Now let's talk about buying Canadian for those in the north. Most of our products are produced right here in Aurora, Ontario, Canada,that's right, you heard me, Made in Canada, even for our US customers this is a good thing for you too! It’s always a good idea to do your research on something before going ahead and marketing to a specific target group. So I though it would be a good idea to check out Wargaming, as I’ve been thinking about it for a long time. Of course we “tag” items for #wargaming, dioramas etc, but I needed to educate myself a little bit more. 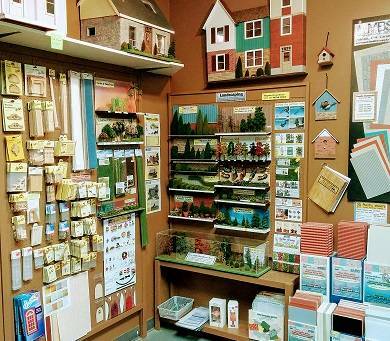 Let’s face it, Model Builders Supply has a lot of products that suit that hobby perfectly. it’s just that if it isn’t marketed to that group specifically we may never see sales from them. 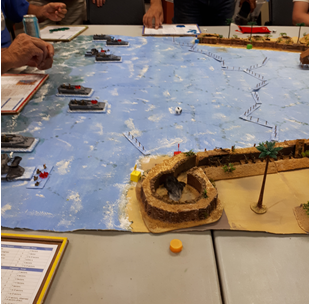 So, I just attended a wargaming mini-convention this past weekend and I have to admit, it’s pretty cool! Here’s what I learned from my visit: The models are scaled differently from what I am used to in the architectural, model train or dollhouse world, however the whole model should be all the same scale. They use measurements like 20mm and 28mm which represent the size of the figures, there’s many different types – WarHammer 40K being just one of them. Some games have props ie: buildings, landscaping, rocks, ships and much more, others are simply board games with dice. Unlike a static model, these game pieces can be moved around or taken off the board completely, including the landscaping. There were all ages in attendance, playing together, and guess what? no cell phones. I even discovered some MBS trees and bushes had been purchased, and put to good use on some of the games. There’s more to war gaming than just modelling, there’s strategy, as any gamer knows they need that to succeed. I’m not a gamer and probably never will be (not exactly sure if “gamer” is how they like to be referred to), but I see a lot of potential in this market, my mind gears were spinning as soon as I stepped through the door and I’m very excited by the prospect of creating products for this market. It would appear that it’s not always about the model (as it is in my business) but more about the playing of the game. I will accept all forms of comments that will educate me on this topic. It seems to me that people shop on line more than ever these days (wow, I sound like my grandmother). Model Builders Supply was Founded in 1976 and we manufacturers a wide range of quality scale model parts for hobbyists and professional model makers, in scales 1:1200-1:12 (Train scales Z, N, HO, O & G). We are a world leading ma nufacturer of Plastic patterned vacuum formed sheets in many scales and colors, such as miniature bricks, roofing, siding, stone, treadplate….. Quality miniature landscaping, non fading, non drying foliage, grass, flowers, trees, hedges….. People, cars, fence, trusses, windows, doors, skylights and a whole lot of engineering and structural fittings….Train scenery, Dollhouse, birdhouse and fairy house building supplies, wargaming and much more. We distribute our products worldwide so you just might find our products in your local hobby store. We also do custom work: Restoring or reproducing sculptures, corporate gifts, antique matching, vacuum forming, laser cutting and more. Just remember, anything can be re-created in miniature! Come for a visit to our showroom and clearance centre where you can see and touch all our products and take your purchases with you, along with our 80 page catalogue. You can also come out to one of the many model railroad train shows that are offered around and you might see us there too! The kids are back to school, vacations are over, the air is getting cooler and it’s time to prepare to hunker down in the basement to work on your model railroad layout. You know who you are. First, make sure you carefully dust off everything before beginning to plant any new MBS landscaping materials, this can be done with one of those aerosol cans for cleaning computer keyboards. If the dust doesn’t easily come off you can spray your grass, trees and bushes with Krylon (or any brand) clear mat coat, this will bring the colors back to life cause “Beautiful dusty trees” said no one ever! 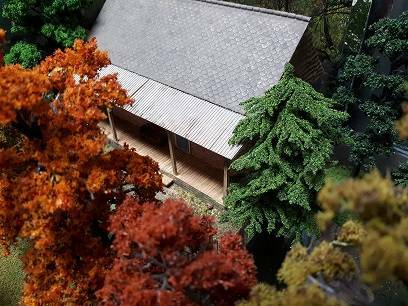 Don’t be afraid to add some seasonal color to your layout, Model Builders Supply has a great selection of colorful blossom growies, fall trees and foliage. When you’re ready to poke your head out for food, water etc. come out to one of the many model railroad train shows that are offered this fall, even if it’s just to get some ideas and check out the weather. Let's just talk about how Model Builders Supply got started in model making. In 1957 model building in Canada was rather crude, with architectural models made mostly from card and balsa wood. Engineering models were built from wire, discs, turned wood, cardboard tubes and strip wood structures. Plastics were only just emerging. Keith Day (Founder of Model Builders Supply) was a pioneer in evolving and developing the sophisticated methods and techniques that today are widely adopted. He arrived in Canada from England in 1956. Scale models are still the most effective and instant way of communicating a concept, in spite of the advances in computerization. In engineering process design, it was almost unheard of not to construct a physical 3D model of any consequential project. The model naturally becomes the focal meeting and proving point for the design of all disciplines, within the constraints of priority for space, accessibility, construction sequencing and function. In this context the aesthetics are a minimal consideration, but accuracy is paramount. In architecture, the considerations are much more concerned with form and aesthetics as well as function. Therefore, in many aspects of architectural model making, surface texture and colour also play an important role. Architectural, Engineering, Interior design layout, Displays & Prototypes, Forensic, Special Effects for Film & TV, Medical and more.